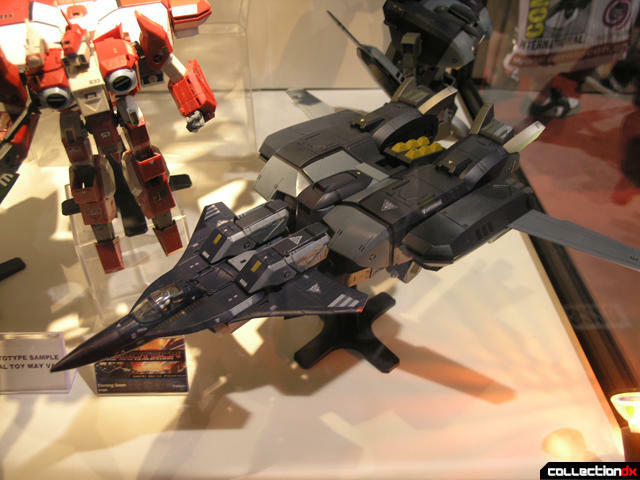 VF-1D is painted custom - Toynami wants to do valks that haven't been done before. Dioramas are all scratch built and not going into production. Giftset with vintage style packaging limited to 20 peices at Comi-con, wide release coming later. You can tell the comicon release by the white box handle instead of black. 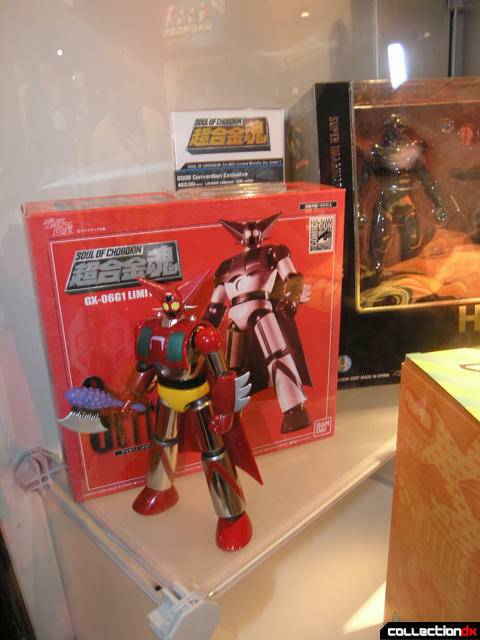 GX-06G1 Getter One Metallic is SDCC exclusive, limited to 500pcs in the US. Will also be offered for sale at Japanese Tamashii site, as well as future Tamashii Nations event in Japan. Toynami plans to bring SOC to us starting in 2009. Two versions will be released. First version will be a straight import - same price as Japan, same release date, same toy and packaging. Only change is Toynami sticker on back. Second version will be US exclusive release, with different paint schemes and packaging, POSSIBLY some changes to molds to fix prior QC issues. There is the possibility that CERTAIN Soul of Chogokin toys will be released under a CERTAIN label, with art by Alex Ross. This is still TBD. CONFIRMED - Japan and HK version of SOC are made in the same factory at the same time - NO DIFFERENCE aside from sticker on box. Now that's what a Beta Fighter toy is suppose to look like! It's time to start collecting SOC!! Thanks Toynami for letting people know about that exclusive Voltron. 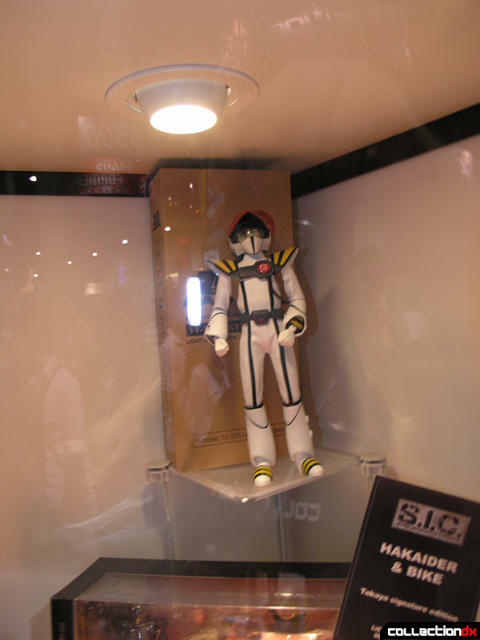 I would've gone for that, as well as the light-up Hikaru. The Beta looks good, but unless they changed their QC lately, it's still Toynami. Redesigned heads? So canon has nothing to do with it huh? As long as Toynami has nothing to do with production of anything with SOC on it, fine. As long as Valkyries that haven't been done doesn't include crap like that last Masterpiece VF-1R abortion and sticks to canon, great. Battle pods look a bit too big, but since they're mock-ups, lets hope the final ones are closer. Toynami really needs to step up and make the leg joints right, floppy-legged pods won't do. 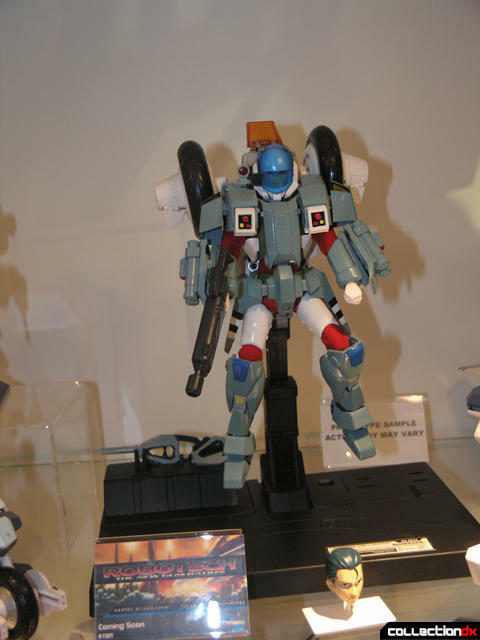 I've got the 1/6 Hikaru in flight suit, very nice, you can tell Toynami had nothing to do with the production. Alex Ross? Chogokin? Gatchaman? Maybe a US GX-01R++? Tranzor Z? Time to find someone with loose lips. EDIT: I managed to score the light-up Hikaru. Still hoping to nab that Voltron. There is no 'canon' regarding the Beta heads. The only Beta ever shown in battloid mode in the animation is the blue one. I think the new matching heads for the other colors are clever. The canon is questionable since the show did not show other heads, and lineart was black and white. 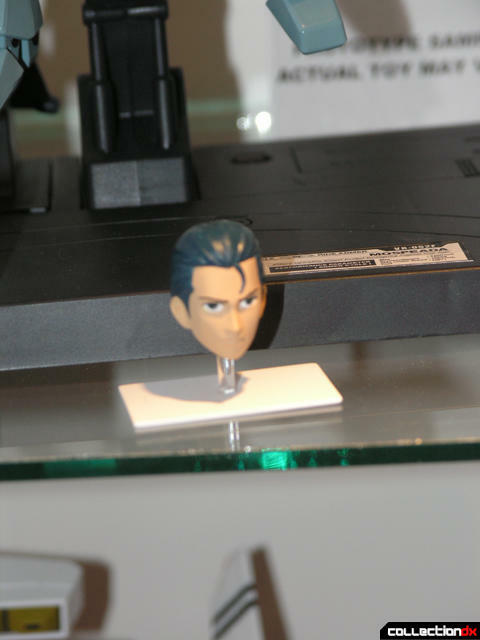 It's been presumed that the Tlead was one model since nothing has shown otherwise, but Tommy Yune didn't design the Tlead, so adding some made up head doesn't make it canon. In the end it's feasible and a nod to the style of the designs of the different Legioss, but it's more of an insult to Artmic and the original designers to just slap on some made up head. A consultation with Aramaki would've been nice, and a selling point, although it goes along with how the whole Tlead came about - one morning he walks in and sees this thing attached to his design. The Mospeada CM's Tleads all had the same head, so there's precedent, but it all comes down to what the consumer will buy. I'm still interested, but after hearing that it just rests on the bar like the CM's, it still seems like another missed opportunity. Really, who gives a flying f*ck about canon? You're getting three new toys in a series that aren't just simple repaints of the first. And how would you design the bar? Wow Roger, you take on a different persona than TBDX when you post here. As for the bar, I just want the damn thing to click or snap on so it doesn't just sit there. It's a damn site better than what CM's did, but going by the quote of the person speaking in the video, it sounds like it suffers from the same issues as the CM's. It sits on it but is not secure, it appears more stable than the mess CM's did, yet having the nosecone go "through" the bar seems laughable. The whole crotch area seems like a place to employ some springed clamp that could hold it on. I guess I'm over-reacting to the heads, it just seemed like they nonchalantly added something that didn't need to be there. I'm a purist when it comes to this kind of stuff, the red Tlead is already something I'm not too keen on. The argument can be made that dozens of variations exist outside of what was shown, but then it all just goes into Battletech territory where original designs get perverted. "Persona?" Who is it that you have me confused with? I'm a little surprised that there bringing the SOC line over seas. I might start pick up more peices of this line if it means I won't have to pay $20-40 dollars on shipping. Bandai saw that people were importing them and paying 10%-30% more to do so. Why make others rich when you can cut them out and sell your own product to the consumer? Diamond wasn't exactly doing a good job with their previous partnership. The whole preorder and upfront costs to barely-afloat comic shops for something that has a very niche market just didn't work. It's great to pick up discounted SoCs from places like BBTS and others, but it reflects poorly on Bandai when their stuff gets marked down. This is great news for SoC buyers, as long as Toynami keeps it's butterfingers out of production, we can stop spending more on overseas shipping or waiting an extra month for surface mail. And the possibility of alternate versions sounds interesting, although Japan needs to realize nobody here cares about clear or black versions of toys. Duke, you'd be suprised how many people (including myself) love clear versions, or even black versions. Since they are always the first to get marked down and the last of what's left in stock everywhere I see. I can understand you being a little negative towards Toynami because the QC has not been stellar. 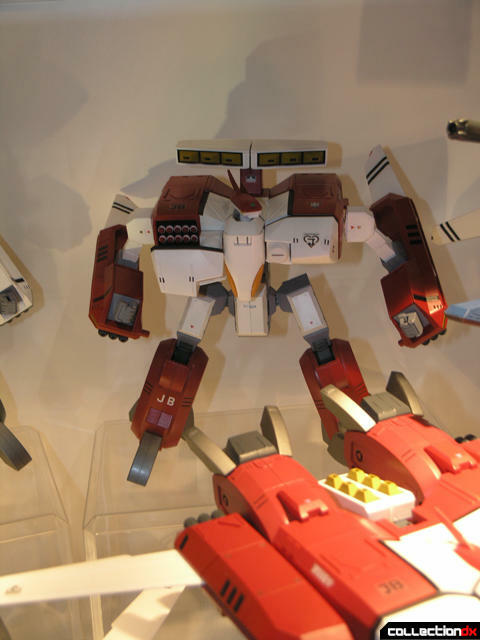 However, I cant help but think that you are overlooking what a great quality job Toynami did with the Voltron. I know Toynami has had its "growing pains" but so has'nt other smaller manufacturers. Josh and I have personally met with George Sohn (president of Toynami) and he is very sincere and dedicated to bringing a quality product to the fans. My point is, keep an open mind. Voltron was great and the Beta's are looking like they might be great also. Trust me, when you see the different heads in person you will see they look killer! as a hater, i'm willing to give a beta a chance, but really, the whole thing just reeks of "too little, too late"- and the whole QC issue could have been fixed a long time ago, instead of them constantly releasing the same bad QC pieces over and over again. When you're charging $80+ for a toy, and it has so many issues, and you don't fix them, but say you are going to with every release, people don't forget that. Yamato had the same issues, but it took, what, 3,4 releases before the issues were corrected? Toynami burned everyone who bought the first 8 Masterpieces, and promised a Beta over and over, and it took another company to release the design and bomb for Toynami to get one out there. And still, they're using the same CM's connection... i don't know. 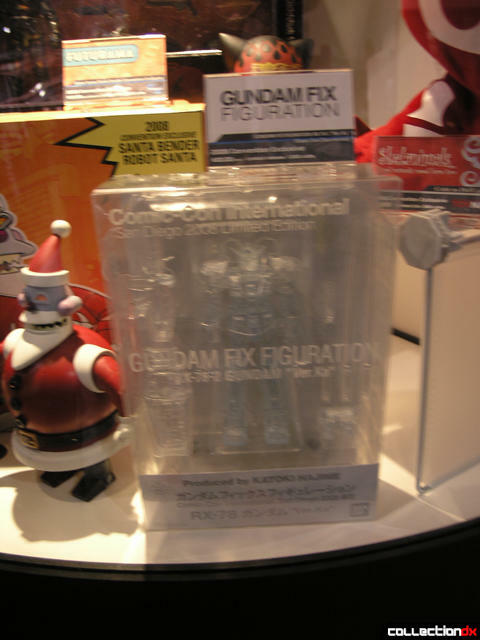 I'm sure George is a nice guy, but what happens at SDCC with Toynami and what hits the shelf are two completely different things, Voltron being the exception. Finally- the BETA. Only, what, 4 years too late? I don't understand why a niche company that's trying to put out diecast toys, doesn't LISTEN to the people who buy their toys- they seem to listen to the board room way too much. I think I am the only person in America who was able to order SOCs direct from Diamond, and actually *recieve* the items i paid for, and I think it was only because I was the one making the call! The reps never, ever, once, knew what we were talking about, and would constantly leave SOCs off of any order that wasn't phoned in directly. The only sad thing is that there won't be any more super deals on older SOC, Diamond would constantly discount them, sometimes making the retail store-price as low as $30! also, think about this sentence: "POSSIBLY some changes to molds to fix prior QC issues." 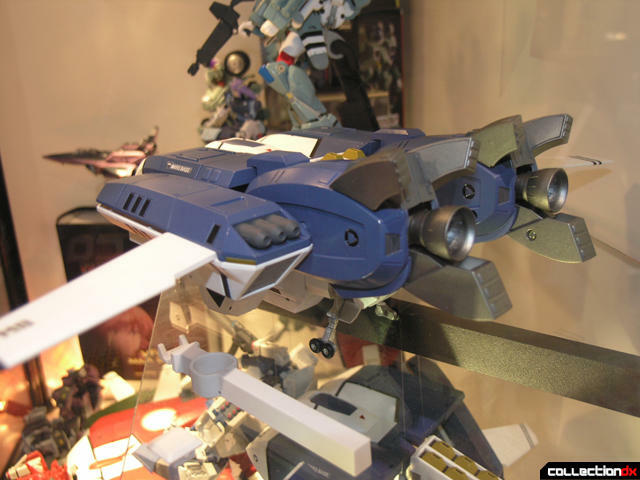 -- if Toynami thinks it can improve Bandai's QC, then i'd like a hit of what they're smoking. I think everyone knows my intense hatred for Toynami. I am actually seriously thinking about giving the Beta a chance, the price and diecast are of course appealing, but i'm sure there will be something stupid about it that will make me angry. I hope that Toynami realizes there is a whole subset of collectors who spend money on Black and Clear variants (when they don't fall apart! )- I know I don't speak for myself when I say Clear versions of Mazinger, Voltes, Voltron, and the Mospeada Mechs would KILL IT. Hell, I'll buy a clear Masterpiece valkyrie, even though they sucked, just to PROVE to Toynami that we NEED more black & clear variants. Black or mechanical Voltron? If Toynami did that, it would go a long way to begin to make up for the $300+ I blew on valks and alphas that broke, or that i had to sell because they were trash. I'll have to agree with The Big R on this one. 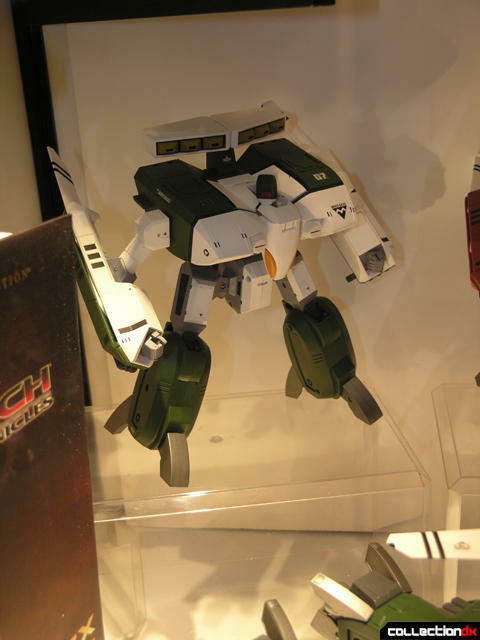 Toynami has failed us before over and over again with their Robotech toys, and now I see before my eyes that they got their hands on SOC series from Bandai? I got to be honest here but I strongly don't feel comfortable with Toynami distributing SOCs here. I mean I don't believe they're qualified to do that sort of thing. I don't want them tinkering with Bandai's toy engineering department. I mean this is just too awkward and weird to accept this predicament. 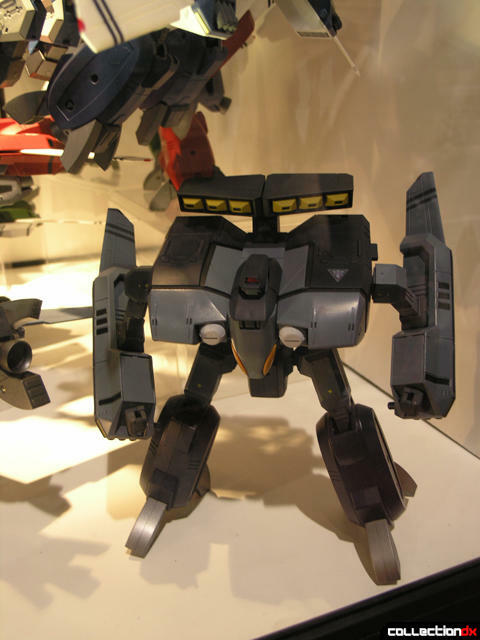 I just find it awkward and BS for Bandai to make deals with a US toy company whose license has kept them from distributing Macross toys to our shores and caused a legal turmoil (correct me on this if I'm wrong guys and gals). Here's another thing, why do I need Toynami to sell SOCs when I got BBTS, Digital-Toys, and EBay? I mean...C'mon?! This is just too much to handle. I'm sorry.....but I think I'll pass on Toynami's offer on this one and stick to my current dealers. Matter of fact, I'll stick to Yamato as well. They too had their share of downers, but at least they've improved on the quality designs on their toys way more ahead than Toynami has...unless someone can prove me wrong. 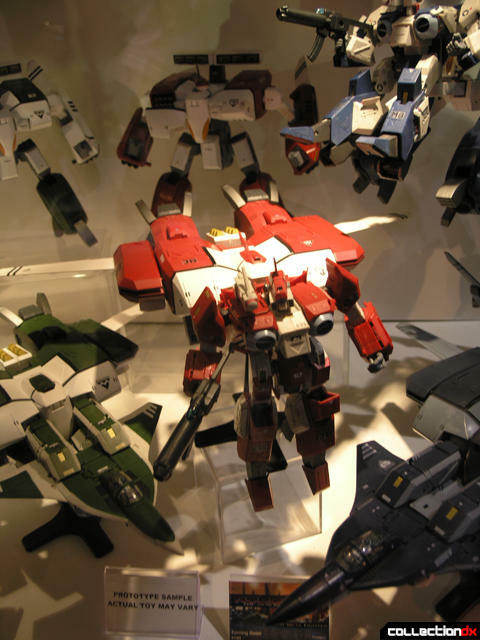 Well fortunately, since they're just distributing, the closest Toynami gets to the Bandai engineering is encountering the completed product when it arrives in the U.S.
... oh, and a wall of Toynami Alphas, 1/100th scale VF-1s, and imported Megahouse Ride Armors - all available in a store with a wide selection, where I can physically pick up the product, inspect it, pick the nicest condition one, and walk away with it in the course of an afternoon. If I could do that with Bandai's SOCs, I'd be in heaven. Greatly impoverished, but still, heaven. Toynami is just using their customer base as a distributor, and I see this as a good thing. It will mean wider availability, local selection, and very likely lower prices both locally AND at our favored e-tailers. Since Toynami wont be touching engineering or design, you wont be worrying about quality, either. This is probably the ONE TIME I'll find myself saying this, ever, but ... give Toynami a chance. ... I feel kind of dirty now. *SIGH* Dude....You've got a point there. I'll admit that with no string on the dollar. Toynami will indeed benefit the SOC collectors' piggy-bank saving by distributing Chogokin at a fair price as long as they're doing just that and only that. Okay dude, since you've responded my concerns in a very diplomatic manner: I've thought it over.....I'll give Toynami a chance. Let's see how they do...but I still think Yamato Toys and Ebay rocks. Toynami has done a brilliant job with distributing toys. Perfect example: the Megahouse Cyclones. Cheap and accessible. Imagine that with SoCs. I mean, c'mon, I love eBay as much as the next guy, but if you try to buy an SoC when it first comes out, sure, you get it for retail from Hong Kong...plus $57 shipping. F- that. BBTS and the like are often your best bet unless you get regular shipments from your "agent in Japan" who can tuck one into a shipment to save some cash. But with the promise of official domestic distribution from a proven company like Toynami, just like with the Megahouse Cyclones, their prices will blow away even domestic e-tailers like BBTS. I'm actually not entirely convinced that they'll leave the finished, manufactured product alone, however. 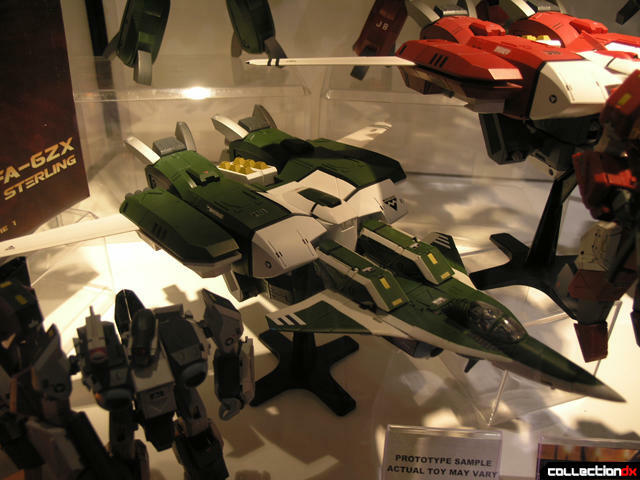 At Comic-Con, they mentioned that they were going to be re-tooling the heads on the old-school 1/55 Valkyries. Hey, sounds good to me; I'll be willing to give that a shot. Hell, maybe they can come up with some sort of gunpod clip that allows it to be mounted in Fighter mode with the armor on or off...FINALLY. Anyway, I think small additions like that will be more of what Toynami will be handling...nothing major. We'll see how it turns out. The last point I want to make is to clear up some licensing confusion. Gentlemen, say it with me, slowly: TOYNAMI DOES NOT POSSESS THE MACROSS LICENSE IN THE US. You're thinking of Harmony Gold. Harmony Gold originally thought they legally purchased the sole rights to the Macross in the US. Well, if they want what they paid for, it's their right to fight for it, right? My point is that Harmony Gold--NOT Toynami--possesses the Macross license. Toynami is NOT a division or subsidiary of Harmony Gold. Toynami is a fully independent toy distributor and manufacturer. Yes, they work with Harmony Gold...duh...otherwise they wouldn't be able to sell their stuff here at all. But that's it. These are toys, guys. Leave out the politics and bickering--leave that to Palin and Biden tonight! ;) I like seeing bold moves like this from any toy company; that means more choices for me. If the toys are good, I'll buy them. If they're not, I won't. How many times have we been burned by Yamato Valks? Oh well. That's not going to keep me from buying their new, proven-awesome 1/60, is it? If so, then I'd be a jackass. Any chances of an Alpha Reissue? Perhaps with better QC? Also, anybody else having trouble getting the video to play properly? There will be "new" Alphas released, don't sweat, just the Shadow Chronicles colors. They appear to be the same as the other Alpha releases, just in new colors w/ new heads. I sure hope they re-release updated versions of the original-color Alphas to go with the Betas, as I know a lot of people sold off their Alphas when they started hitting the $200 mark a while back (i did! ), and selling the Betas without Alphas is retail suicide, it's an easy "add-on" purchase for most brick & mortar shops, that's what they look for with these high-end types of purchases. I had issues with playing the video too, since yesterday- if i skip around, it seems to work, but if i let it play from the top, it stops about 5min in. George seems enthusiastic and nice, but he's dancing around the serious questions, like connection, die-cast content... he obivously was familiar with CM's Beta until you guys asked about its connection method, and suddenly he knows nothing about it, yeah right... someone's got to tell that guy though, the "snake oil salesman" thing doesn't work. It may work selling One Piece toys to Toys R Us, but Direct Market shops and retailers don't have the kind of money to spend on cases of more expensive items... and that when you dance around questions, it makes retailers sketchy to order cases of your product... isn't that what SDCC is about, getting retailers to order cases of product? Wow, this is great news. 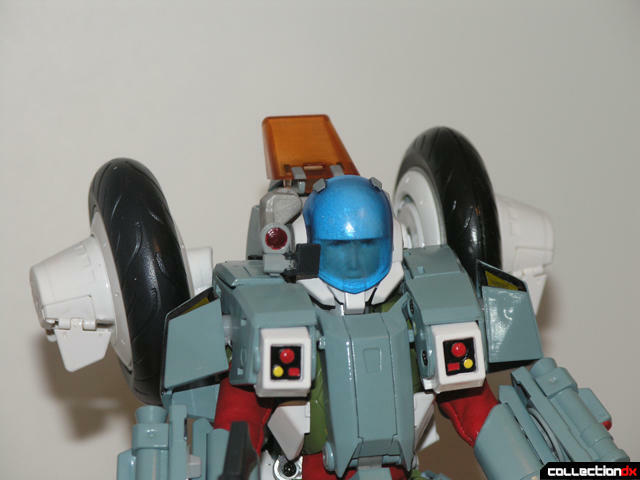 Toynami PLEASE make a MIGHTY ORBOTS repaint of SOC Godmars.